Not to be confused with Bill Blaster. The Bullet Blaster is Bowser Jr.'s unlockable kart in Mario Kart: Double Dash!!. It is shaped like a Banzai Bill, and like Diddy Kong's Barrel Train, is one of the fastest lightweight karts in the game. Unfortunately, this kart is also the lightest kart in the game, and can be knocked around by any other kart of any weight class. Another one of the kart's good stats is its acceleration, which is lower than the regular lightweight kart, but still better than a heavyweight. Its horn makes the sound of a noisemaker. The Bullet Blaster is unlocked by completing the Special Cup in 50cc. In terms of its actual stats, while the Bullet Blaster does have a three star acceleration stat, it's one of the weaker accelerating karts, equalling the Red Fire and the Parade Kart. Also, its top speed is tied with that of the Barrel Train, DK Jumbo, and Piranha Pipes. Lastly, although the Bullet Blaster is a lightweight kart, it's tied with the Koopa King for having the slowest off-road speed in the game. The Bullet Blaster also appears in Super Smash Bros. Brawl as a sticker. Normally the Bullet Blaster would easily be pushed around by the Goo-Goo Buggy. 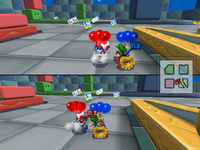 In Battle Mode, for some unknown reason, the Goo-Goo Buggy's weight is tied with this kart. In any other game mode though, the Goo-Goo Buggy can easily push the Bullet Blaster around. The Bullet Bike and Road Jetter in Mario Kart Wii and Mario Kart Arcade GP DX are similar to the Bullet Blaster. The Bullet Blaster resembles the Banzai Bill seen on the Princess Peach's Castle stage in Super Smash Bros. Melee. In the North American version of Super Smash Bros. Brawl, the Bullet Bill trophy mistakenly gives the name "Bullet Blaster" for its special cannon. This is corrected to "Bill Blaster" in the PAL version. This page was last edited on November 25, 2018, at 11:13.